20160331 - Up in the am and into work. L and the boys hung out and watched movies and hit the grocery today. I worked late and grabbed the fam when I got home to head out for dinner. 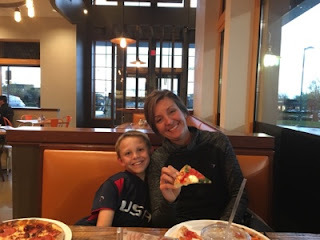 We returned some videos and went to Cucinova to get personalized pizzas for dinner. I had a bit of a sneezing attack and sprayed a window with pizza particles due to an unstoppable sneeze :-o Home and watched a movie and had some ice cream. D texted L right after midnight 'Happy birthday mom', it almost made her cry. Sometimes he's a good boy.